Burr Elm veneers with palisander & black edging and beautiful chinoiserie style bird & flower inlay. Choose from 50 note clockwork wound movements. To hear tune samples, click here. 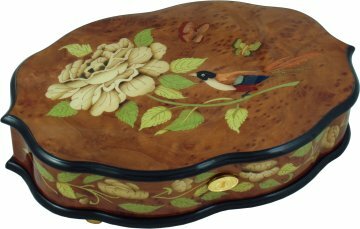 A 50 note cylinder musical box musical box hand crafted using in the finest burr elm veneers & inlaid with a chinoiserie inspired bird & flower with butterflies design. 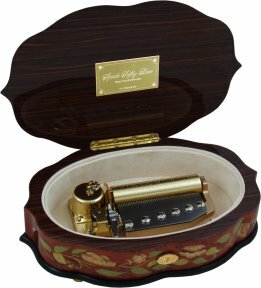 A choice of harmonious sounding 50 note size movements are available & once wound from the key underneath, this music box operates from the button at the front of the box. Slide the button to the right & the music will start to play; slide to the left & the music will stop at the end of the tune. This enables you to listen to the music box with the lid open or closed. A truly stunning music box. For more information on the musical movements used, please click here.